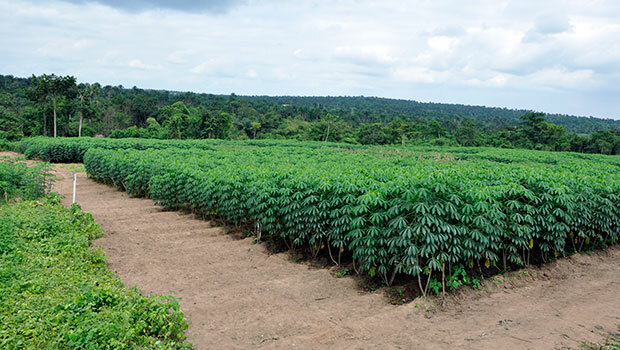 A green cassava field in Ibadan, Nigeria. A team of scientists, including Philip K. Thornton, Anthony Whitbread, and Lieven Claessens, under the CGIAR Research Program on Climate Change, Agriculture and Food Security (CCAFS), from several international research organizations including IITA, have identified the need to intensify agricultural research for development, so as to meet the Sustainable Development Goals associated with food production, human nutrition, climate change, and environmental protection in a world with 9.7 billion people by 2050. A key part of addressing this challenge will revolve around effective priority setting in Climate-smart Agriculture (CSA) that can provide information to help guide best-bet technology, policy, and investment action that leads to desired, long-term development outcomes while meeting local, immediate needs for food security. Estimates of the needed increase vary between 25 and 70%, depending on the assumptions made about efficiency and consumption pattern changes. One response to these recognized needs is the climate-smart agriculture approach. This approach has brought recognition that there will be multiple alternative pathways to sustainable agricultural systems. Climate-smart agriculture is widely promoted towards reorienting agricultural development under the realities of climate change; however, prioritizing its activities is crucial, given the need to use scarce resources as effectively as possible. The scientists noted that prioritization in CSA involves six steps: (1) identifying system entry points and impact pathway; (2) defining spatial and temporal scale; (3) formulating research questions and how will they be addressed; (4) estimating production, adaptation, mitigation research impacts; (5) estimating other environmental and social impacts; (6) determining what is needed to go from research output to impact.